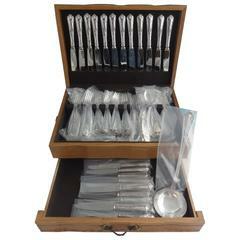 Rare early dinner size Lady Caroline by Gorham circa 1897 silver plated flatware set, 36 pieces. 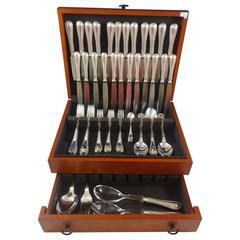 This set includes: 6 dinner size knives with plated blunt blades, 9 3/4" 6 dinner size forks, 7 3/4" 6 luncheon/dessert forks, 7" 6 teaspoons, 5 3/4" 6 place soup spoons, 7" 6 gumbo soup spoons, 6 3/4" Includes bonus vintage storage chest (chest is in as-is estate condition). Very good condition, with minor surface scratches, as expected with age. Matching script monogram. This set will be beautifully polished and sealed in individual plastic sleeves prior to shipping. 100% Satisfaction guaranteed!